Podcasts and storytelling are both experiencing a kind of renaissance, (e.g., Baum, 2015; Friedersdorf, 2014), and these media have value for engaging students in science. When teaching science, instructors need to think about both the language they are using to communicate science and ways to facilitate students’ use of language for science talk. Preservice secondary teacher candidates often feel prepared and enthusiastic to teach science but less prepared (or enthusiastic) to teach the language necessary to communicate about science. Conversely, many preservice elementary education candidates feel confident in their ability to teach literacy, but less confident in their ability to teach science beyond the vocabulary (see also Tosun, 2000). Many secondary science preservice teacher candidates assert that they want to be science teachers because they “love biology” or “want to share [their] love for science.” Perhaps as a result, these candidates’ initial focus in their preparation programs is the science content. We encourage our teacher candidates’ passion for the content and agree that strong content knowledge in science teachers is essential. However, we have observed that our teacher candidates often overlook the importance of understanding their students and of using that knowledge to facilitate students’ understanding of both science content and academic language in the discipline. Although some states have increased the science content credit requirements for preservice elementary education candidates in the last 10 years, many of the elementary teacher candidates we work with still express a lack of self-efficacy in teaching science to their students. In addition, research emphasizes the importance of educators using students’ cultural and linguistic experiences when teaching science, as it can result in significant science learning gains (for review, see Lee, 2002). Preservice teacher candidates often struggle with applying culturally relevant pedagogy into science teaching, however, and some teacher educators have called for development of more practical approaches to applying culturally and linguistically relevant pedagogy in elementary science classrooms (Patchen & Cox-Peterson, 2008). Aside from needing additional support in learning about their students’ assets, our teachers also need support in teaching academic language. In Georgia, where this study took place, data show that elementary students categorized as limited English proficient (LEP) can struggle with science on criterion-referenced competency tests (CRCT). In 2014, 70% of LEP students met or exceeded standards in science, compared to 81% of non-LEP students. End-of-course-test (EOCT) data collected in secondary schools seem to indicate that the gap gets wider as students get older, particularly in biology. In 2013-2014 the percentage of non-LEP students who met or exceeded standards on the biology exam was 76%, compared to 44% of LEP students. In contrast, 56% of LEP students met or exceeded standards on the physical science exam in the same year, compared to 81% of non-LEP students (Governor’s Office of Student Achievement, 2014). Teacher candidates will benefit from having as many tools as possible to help their students gain understanding and fluency in using the academic language associated with science (Pearson, Moje, & Greenleaf, 2010; Silva, Weinburgh, & Smith, 2013). Many of the teacher candidates we guide, whether elementary or secondary, will enter linguistically diverse classrooms. In order to meet their students’ needs, candidates should be skilled in differentiation strategies that help all students use academic language appropriately, both orally and in writing, as well as connect the science and the language to their everyday lives. One way we have approached these challenges is by developing a podcasting assignment for preservice teacher candidates. Sharing personal stories about science can help scientists (and science teachers) humanize a subject area and profession that often seems cold and disconnected with real life (e.g., Barker, 2013; Linett, 2013). Personal science stories, in which teachers share something that happened to them in the context of science, are a type of story often recalled in detail by students when they are interviewed about what they remember from a lecture (Frisch & Saunders, 2008). Biology teachers have also reported that framing science in the form of a story can make the content more comprehensible, especially to English learners (ELs; Dong, 2002). Beyond helping students connect the science to their own lived experiences, having an opportunity to share personal science stories can be a means of empowering students to express themselves and investigate the extent to which science is present for them in their own lives. Listening to and telling personal science stories also gives students a chance to develop and use oral listening and speaking skills and to use academic language in context. Culturally responsive teaching places an emphasis on learning about and teaching in a way that highlights students’ strengths (Gay, 2002). We have tried to emphasize Moll, Amanti, Neff, and Gonzalez’s (1992) Funds of Knowledge concept to help our students collect, analyze, and use information about their students’ assets when they are planning their instruction. Oral storytelling is a way for instructors to use a culturally connected mode of communication to help students make connections, and good storytellers effectively identify their audience’s culture and assets in order to shape their stories (Harris et al., 2016). Lemke (1990) argued that science teachers must work toward bridging “differentiated speech” in their classrooms, helping students scaffold their language use from everyday language to scientific discourse. Lee, Quinn, and Valdes (2013) proposed that “when students, especially [ELs], are…supported to ‘do’ specific things with language, both science learning and language learning are promoted” (p. 224). They synthesized the literature about science and ELs, and stated that when it comes to ELs “the work first focuses on discussion of scientific concepts in everyday English and then provides instructional scaffolds to help students convert the concepts into scientific language” (p. 226). Lee and colleagues also have a long line of research (e.g., Lee, Buxton, Lewis, & LeRoy, 2006) supporting the idea that for ELs learning is enhanced when links between students’ cultural and linguistic backgrounds and the academic content are emphasized. Storytelling is a way that language is often used in students’ homes (e.g., Reese, 2012; Sorensen, 2012), and explicitly connecting academic language within a science lesson with language used in the context of a story may be one intriguing way to emphasize these links. Scaffolding this kind of learning across grade levels seems helpful, as well. Preservice elementary teachers are often confident in their abilities to teach using stories, so allowing them to use stories to learn and teach about science can sometimes help them develop a more scientific understanding of concepts or help them identify parts of concepts with which they struggle (Frisch, 2010). Digital storytelling is a technology-based approach to telling a story. This approach can involve a writer selecting a topic, doing research, and writing and recording a script, while also using images and audio effects to help make the story come alive for viewers. One of the most powerful aspects of this medium is that it allows authors to present their point of view and take ownership of a story (Shelby-Caffey, Ubeda, & Jenkins, 2014). Digital stories have been used to help preservice teachers reflect on their learning, and evidence suggests that the use of this instructional strategy promotes the acquisition of high-level reflection in this population (Ivala, Gachago, Condy, & Chicona, 2014). Digital storytelling can give students and teachers opportunities to practice valuable 21st-century skills, including digital and information literacy. Economy: the story is under 10 minutes. Even without visual images to complement the narrative, these seven elements can be met using audio story podcasts. Audio podcasts can be an effective way to reinforce academic language, both in terms of vocabulary and in language function and fluency. Putman and Kingsley (2009) found that fifth graders who used teacher-prepared podcasts that focused on science vocabulary performed significantly better on vocabulary tests than did students who received classroom instruction alone. Student responses indicated that students both enjoyed the podcasts and found them helpful in terms of reviewing words they had forgotten. Borgia (2009) found that fifth-grade students who were given access to teacher-created podcasts as a supplementary tool were able to increase their vocabulary retention. Dong (2002) observed that effective biology teachers provide ELs with assignments that offered authentic practice in speaking, reading, and writing in the context of biology learning, and this additional practice (especially if done in groups) can reduce speaking anxiety and enhance students’ ability to communicate about science. To this end, the podcasting assignment described in this paper gives teacher candidates an opportunity to gain skill in writing and producing podcasts that can help students gain content understanding and science literacy. Another goal of the podcasting assignment is to encourage teacher candidates to gain skill in podcasting, so that they feel confident in providing opportunities for their future students to write and produce podcasts. Hughes, Liu, and Lim (2016) described this practice as “technological modeling,” wherein preservice teacher educators show their candidates robust examples of using technology in the context of teaching in an effort to get the preservice teachers comfortable using technology-supported teaching in a meaningful way with students. When K-12 students are allowed to write and produce their own podcasts, the benefits to literacy are enhanced. They have more opportunities to engage in recognizing the purposes of different kinds of writing and practicing reading and writing in a sustained way to promote fluency (Smythe & Neufeld, 2010). Vasinda and McLeod (2011) used the idea of “Readers Theatre,” in which elementary students practice reading and rereading stories as a performance, integrated with the medium of podcasting, and found that struggling readers in the study gained an average of one grade level equivalency over 10 weeks. Students and teachers participating in this project reported that they appreciated the fact that podcasts allowed students’ work to have a wider and more permanent audience and that editing the podcasts allowed them to “see” the aspects of their language use, which was useful for the students as they worked with the language. Pegrum, Bartle, and Longnecker (2015) reported that giving students an opportunity to create their own podcasts on chemistry topics resulted in a significant improvement in exam scores on that topic (compared to a topic about which they did not write a podcast), supporting the idea that writing podcasts can lead to deeper understanding of content. Additionally, integrating writing and producing podcasts (particularly podcasts that require students to do research) into regular instruction can lead to a multiliteracy approach Teacher candidates and their students learn about language and science in the context of technology, and they also increase their skill in using technology in an authentic manner (Borsheim, Merritt, & Reed, 2008). What types of science stories do our preservice teachers construct when asked to develop a science story podcast? What depth of science content and academic vocabulary use is evident in candidates’ story podcasts? As a part of the National Science Foundation Noyce Scholarship grant, TELBio: Teaching English Learners Biology, we developed an assignment that asked teacher candidates to share a story from their lives and then insert some science into their stories. Candidates then developed a podcast using their personal science stories, as well as lesson plans or teachers’ guides that focus on academic language. We pilot-tested this assignment with a population of preservice elementary teachers (n = 16) and Master of Arts in Teaching (MAT) in biology candidates (n = 9) in science methods courses. We chose to use an audio story podcast rather than a typical digital story for three reasons: (a) We wanted our candidates to have the time and motivation to focus on the language they used in their stories, (b) we wanted to use only one instructional technology tool (in this case, Audacity, a free open source digital audio editor and recording computer software application) and give our teachers experience using the technology in context, and (c) previous work by the first author (unpublished) indicated that when designing vodcasts (i.e., video podcast), students tended to spend most of their planning time focusing on choosing and editing the images, ending up with less time to construct and polish the narrative. The design of the podcasting assignment followed the style of Story Collider (http://storycollider.org), which focuses on people (both scientists and nonscientists) telling personal stories about science to a general audience (Linett, 2013). We provided candidates with links to the Story Collider podcast but noted that many of the stories included explicit language and were designed primarily for adult audiences. In addition, the first author wrote and recorded a few example personal science story podcasts that could be used in a secondary classroom, and these examples were provided to candidates. Candidates were asked to use Audacity to produce their podcasts but were not given explicit support with this software in the methods course itself. In spring 2015, we asked preservice elementary education teachers enrolled in a methods course to complete the story podcasting assignment, in connection with a Funds of Knowledge assignment (based on Moll et al., 1992) candidates used to learn about the community in which they taught. That semester brought a few weeks of inclement weather resulting in campus shutdowns while parts of this project were underway. As a result, the instructor (N. Cone) had to provide support for the project entirely online. These candidates were allowed to complete their podcasts individually or in groups. Candidates in this course were beginning their clinical experiences in the classroom and were getting to know the students in their collaborating teachers’ classrooms as they worked on these projects. These candidates were allowed to work in groups for this assignment, resulting in fewer podcasts produced (11) than students in the course (16). The elementary candidates were not asked to write a teachers’ guide to support the podcast. Prior to this course, they had taken a course on instructional technology, including the use of Audacity. Next, in summer 2015, MAT candidates who were enrolled in a science methods course that focused on Knowing the Learner developed their science story podcasts. Of the nine candidates in the course, six were considered career changers (working as biologists, healthcare professionals, or tutors prior to entering the program), and three started the program soon after graduating with a Bachelor of Science degree. The podcasting assignment was modified for the needs of that course, requiring the candidates to write and record their podcasts individually and write a teachers’ guide” to accompany their story podcasts. These teachers’ guides were expected to include an explicit guide to the academic language in the story as well as ways to reinforce language and language function, background information to support the biological content in the story, and reflection questions for teachers and students about the context of the story and connections to their lives. During this same summer, MAT biology candidates were enrolled in an instructional technology (IT) course, and the timing of the assignment was correlated with the time that the IT course covered the use of Audacity. In addition, the IT course instructor was informed that candidates were recording podcasts as a part of their MAT biology coursework and provided time and assistance for candidates to work on their podcasts in the computer lab. In order to answer our research questions, we compiled artifacts including MP3 files of all of the final podcasts, as well as teachers’ guides completed by the MAT biology candidates. We used an interpretive case study approach (Stake, 1995), in which each podcast story was treated as a bounded case, and analyzed the data by using a paradigmatic-type narrative inquiry approach (Polkinghorne, 1995). Chase (2005) described different lenses with which to approach narrative inquiry, including a lens that focuses on the narrative’s author’s voice— the story the author chose to tell and how the author told it. We used this approach to analysis of narrative for our examination of these story podcasts. We listened to the story podcasts individually and discussed our initial impressions of themes that arose from the story podcasts, comparing the approaches taken by the elementary candidates with that of the secondary candidates. The initial themes we identified for analysis and comparison included Use of Story, Use of Science, and Use of Language. For each of these themes, we organized and analyzed data within and across cases and made comparisons between the two groups of candidates. Story podcasts were transcribed using HyperTRANSCRIPT (Ver 1.6) and transferred into HyperRESEARCH (Ver 3.0.3) so we could examine them more closely for evidence related to the initial themes identified. In order to examine candidates’ use of story, we used Lambert’s (2002) “Elements of Digital Storytelling” as a guide to categorize each story podcast according to point of view, dramatic question, emotional content, and soundtrack. We also categorized each story using the “Types of Personal Story” described by Lambert (2010), including character stories (stories that tell you more about the author); memorial stories (stories about someone who has died); adventure stories (stories about travel); accomplishment stories (stories about an achievement); story about a place; or story about what the author does. In order to examine candidates’ use of science in the story, we identified the science concept(s) the story was attempting to convey and identified quotes from each podcast that were representative of the candidates’ attempts to explain the concept(s). We noted examples of occasions where candidates seemed to show evidence of not understanding the science content, and if their explanation could be misinterpreted by a listener, potentially leading to misconceptions. To examine candidates’ use of language, we focused primarily on academic vocabulary. We entered the text of each podcast into AntWordProfiler (Anthony, 2014) in order to identify the percentage of words from each podcast that could be classified as General Service List of English Words (GSL) vocabulary (West, 1953) or Academic Word List (AWL) vocabulary (Coxhead, 2000), and we listed all of the AWL groups used in each podcast. In a typical science textbook, AWL words comprise about 9% of the text, compared to 1.4% of a given work in fiction and 4% in a newspaper (Greene, 2008). Since the story podcasts were designed to include a focus on connecting everyday language to academic language, we examined where candidates’ podcasts fell on this spectrum of word classification. From the words from each podcast that were not labeled as GSL or AWL, we identified scientific vocabulary used in the podcasts, as well as noting which AWL or science-specific vocabulary were explained in the context of the narrative and the Teacher’s Guides. We took note of the percentage of science-related vocabulary words that were not described or explained by the candidates. Tables 1 and 2 summarize the data collected in terms of the types of audio story podcasts preservice elementary (Table 1) and secondary (Table 2) candidates wrote and recorded and how they attempted to use the technology to tell the stories. The idea of writing the podcast based on a personal story was not emphasized with the pilot-test audience of elementary education candidates shown in Table 1, and five out of 11 of the podcasts were not based on the authors’ personal experiences or were written primarily from a third person point of view. One podcast (“Motion sickness”) was entirely expository and had no narrative elements integrated. Another podcast was historical in nature, told from Neil Armstrong’s perspective. Four of the 11 podcasts had no identifiable dramatic question driving the narrative, and five of the podcasts lacked emotional content. Of the podcasts that could be classified as personal stories, two were classified as accomplishment stories, two were character stories, one was a memorial story, one was an adventure story, and one was a story about a place. With secondary science teacher candidates, the idea of making the science story podcasts personal was emphasized, and all of the podcasts produced were written in the first person. However, in one of these podcasts (“Mouth Full”), the narrator/author was an observer to the driving events in the story, and in another (“Malaysia”), the story lacked a satisfying ending, since the listener never learns if any of the characters contracted a mosquito-borne illness. A variety of personal story types were evident from this group of podcasts, including two character stories and three discovery stories. Five of the stories seemed to focus on an embarrassing incident, which was also a focus of the example podcasts provided by the instructor. Seven out of the nine podcasts included soundtrack components intended to enhance the story. Of particular note in this regard were “Hypothermia,” which used audio recorded during the event described in the story; “Cockroach Attack,” which used different types of music and silences at effective points in the story; and “A Tale of a Horse,” which used a particular sound effect in a humorous way. One of the podcast stories (“Mouth Full”) included descriptions of a sexually transmitted disease, which might be considered to be inappropriate for certain secondary classroom populations. Seven of the story podcasts included an identifiable dramatic question. Five included all of the elements of digital stories examined. Note: Some candidates gave informed consent to the authors for online posting of their podcasts; however, as per the informed consent document, they may withdraw consent for posting online at any time. In the future, these links may be broken at the request of the candidate. 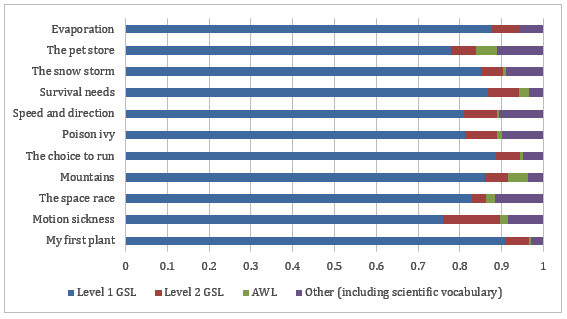 Figures 1 and 2 show a breakdown of the proportion of the percentages of words in each podcast that are found in two levels of the (GSL), where Level 1 includes the 1,000 most common word families used in English and Level 2 includes the next most common 1,000 words. Also included are the word families from Coxhead’s (2000) AWL that were represented in words used in the podcasts. Words in the Other category were generally a combination of proper nouns and science vocabulary; the science vocabulary words were used for the science content analysis described in more detail in the following section. To provide context, Tables 3 and 4 provide the general characteristics of each podcast, including length of the podcast and number of words, as well as a listing of the words from each podcast that are found on the AWL. As shown in Figure 1 and Table 3, the words used in podcasts developed by elementary education candidates typically included words that are relatively common in the English language, with 80-95% of the words from each podcast included on the GSL. Of the 11 podcasts, five included 0-1% vocabulary considered academic (i.e., listed on the AWL), three included 1-3% AWL words, and two included vocabulary comprised of over 3% AWL words. Figure 1. Proportion of words in elementary preservice teacher podcasts by vocabulary type. Level 1 GSL, Level 2 GSL, and AWL words are included; the Other category may include proper nouns, slang, and scientific vocabulary. Note. Underlined words are words that were explained in the podcast. Tables 5 and 6 show the extent to which the podcasts used and explained scientific vocabulary and concepts. Table 5, which includes the preservice elementary teacher podcasts, includes notes on possible misconceptions that might arise based on explanations in the podcasts. Table 6, showing the secondary teacher candidate podcasts, also includes scientific vocabulary words that were included in the teachers’ guides but were not used explicitly in the podcasts themselves. None of the secondary teacher candidate podcasts showed evidence of potential misconceptions, and the elementary teacher candidates did not write teachers’ guides as a part of their assignment. As seen in Table 5, eight of the 11 elementary teacher candidates’ story podcasts typically included five or fewer scientific vocabulary words, and one did not include any identifiable science concepts. Three of the podcasts included an attempt to explain the science vocabulary used within the story. Two of the podcasts included language or implications that could potentially lead to misconceptions about science concepts. Note. Words underlined were explained by the narrator in the context of the podcast. Table 6 shows that the secondary biology education teacher candidates used between 11 and 37 scientific vocabulary words in their story podcasts. Although some of the scientific vocabulary included in each of the podcasts was explained or described in either the podcast itself, the teacher’s guide, or both, every podcast contained some scientific vocabulary that was not explained. Note. Words underlined were explained by the narrator in the context of the podcast, and words italicized were explained in accompanying teacher’s guides. For the elementary education preservice teacher candidates, the idea of making the story personal was not emphasized; instead, candidates were asked to use the story to make science “come alive” in a way they perceived as meaningful for their students. Despite this instruction, seven of the 11 podcasts completed included some attempt at making a personal science story; that is, including elements in the story that directly connected the events described to the narrator. In some cases, this connection to the narrator could be considered fairly loose: For example, “Survival Needs” told a story about the narrator’s mother’s dog, and “Mountains” gave a brief description of the narrator and her sister climbing Stone Mountain. Of the science stories that were not categorized as personal, one was entirely comprised of a science-based explanation (“Motion Sickness”), one was based on events from the life of a historical figure (“The Space Race”), and two described events in a third-person point of view (“Speed and Direction” and “The Pet Store”). Seven of the 11 story podcasts included a complete narrative arc, including some kind of dramatic question, a climax, and a resolution. The four stories that lacked a complete arc were missing a driving conflict or question. Elementary teacher candidates may struggle with the culture of science, their personal cultures, and students’ cultures. Many consider science to be an objective field of study, which has little to no subjectivity, seemingly making it difficult for them to step out of this box and make science relevant or relatable. This circumstance is underpinned by the knowledge that most of our elementary preservice candidates are Caucasian, and our Caucasian students struggled with their cultural identities. Perhaps as a result, many of these candidates did not consider that it might be helpful to write a story about themselves as children and include some emotional content within the story to enhance connection with their proposed audience. Instead, a number of podcasts were centered in a more general idea of what they believed a typical elementary student might find interesting: racecars, dogs, space, and the like. The connection between the teacher candidate and the student might best be found in the level of emotional engagement present in the story, and perhaps these candidates struggled with connecting themselves to the content as well as to their students. Although these elementary teacher candidates completed the podcast as a component of their Funds of Knowledge assignment, some of the candidates did not make clear connections to how they were using the podcast to connect to their students’ funds of knowledge, or even to their own funds of knowledge. A notable exception was a story podcast from this group of students titled “Poison Ivy.” The narrator described an incident in which she, feeling ignored by her family, rubbed an unknown plant all over her face to make them pay attention to her, only to find out she had made an unfortunate choice in plant. The moral of the story? Know the plants around your home and school. If you love to play outside, go on walks, or hike in the woods often, then you should know what poison ivy looks like, and how to avoid it….and most of all, if you want attention, maybe you shouldn’t rub poison ivy all over you. Two other story podcasts from this group, “The Snowstorm” and “Evaporation,” included engaging story elements, relatable circumstances, and well-voiced narration; however, neither of these stories integrated science concepts in a direct way. Based on our analysis of the stories from this group of candidates, we plan to provide more support in the future to help candidates identify and describe their own connections to culture, to each other, and to science. Providing more example podcasts, particularly examples of podcasts written by their peers, and having a discussion about elements of culture in the story, may help support the candidates in this way. As part of their preparation for this assignment, both groups of elementary and secondary teacher candidates were given access to example podcasts written and recorded by the first author (“Worms” and “Hubris and the Helicopter”). However, the elementary candidates were only provided links and were not required to listen or discuss, while the secondary group listened and discussed the examples in class. Therefore, the elementary candidates’ story structures may not have been influenced by the example podcasts, though it is evident that the secondary candidates’ podcasts were influenced by the examples. Almost all of the story podcasts created by the secondary preservice candidates included a clear narrative arc with a driving conflict or question, climax, and resolution. Secondary biology candidates were also given example teachers’ guides to go along with the example podcasts. In these teachers’ guides a comment that embarrassing or disgusting stories tended to be memorable to secondary students was included. Perhaps not surprisingly, then, seven out of nine podcasts written and recorded by the secondary candidates contained elements that were embarrassing or disgusting. In contrast to the elementary education group, the personal aspect of the science story podcast was emphasized with the secondary candidates, and all nine podcasts were written from a first-person point of view. Seven of the nine podcasts featured the writer/narrator as the protagonist in the story, and two used a first-person point of view, although the narrator was more of an observer to the events, rather than the main character. Seven of nine of the personal science story podcasts were focused on human medicine, one focused on veterinary medicine, and one focused on organismal biology, providing some insight into which types of real-world phenomena our candidates felt were most relatable to their students, and also provided some insight into the backgrounds, strengths, and interests of our candidates. However, these candidates had not yet been in their field placements at the time of this assignment so may not have been sure what kind of concepts or stories would be most accessible to their future students. As a result, they may have depended primarily on the embarrassing or disgusting story information provided to connect to their student population. This cohort of candidates included a high number of career changers, most of whom had some kind of medical background, which is reflected in their choice of content as well. To some degree, the secondary candidates have shown evidence of attempting to develop a story that blends fiction and nonfiction in a culturally conscious way (Harris et al., 2016), in that they shared connections to their own cultures and interests. However, these candidates had not yet spent enough time in the classroom to make connections to students in a culturally conscious way. Completing this kind of assignment again later in the program may be valuable to determine if and how candidates might revise their stories once they know their students better. From a narrative point of view, one of the most effective story podcasts from this group of candidates was “Hypothermia,” in which the writer/author described how she jumped into a freezing river to save her dog. Engaging audio elements (including some audio recorded on the day of the event) and integration of her sense of humor in the story helped to create a connection with the listener. Another strong narrative podcast is “Cockroach Attack,” in which the writer/narrator described the event he marked as the beginning of his fear of cockroaches, despite being an outdoor enthusiast. Again, this story podcast included creative use of music and sound effects, as well as humor and writing that conveyed the narrator’s personality. As evidenced from their science story podcasts, many of the elementary education candidates included in the study were not comfortable describing science concepts and connecting them to their stories. Two of the podcast stories (“The Snow Storm” and “Evaporation”) did not include any direct descriptions of science concepts, and two others (“The Space Race” and “The Choice to Run”) had implied connections to science content rather than explicitly connecting the concepts within the story. One story included only science (“Motion Sickness”), or rather, a brief description of the medical phenomenon and ways to prevent it. When descriptions of the science concepts were present, they were usually described in a way that could be understandable to a typical elementary student and included generally high percentages of words found in Level 1 of the GSL and less than 2% academic language. These story podcasts generally showed evidenced of relaxed pacing, with an average of 156 words spoken per minute; the range was between 119 words/ minute (“My First Plant”) and 191 words/minute (“Speed and Direction”). Most of the podcasts from this group of candidates included five or fewer scientific vocabulary words. The scientific and academic vocabulary used in the podcasts was not often explained in the context of the podcast, but when the percentages of academic and science vocabulary were low enough, the teacher would arguably be able to support learners effectively in the use of those terms during subsequent instruction. However, based on the data collected whether or not the candidates were making thoughtful language choices in their scripts was unclear. A high percentage of words on the GSL did not necessarily reflect evidence that the words used would be easily understandable by an elementary audience. These candidates would probably benefit from more support in connecting science concepts to their stories, perhaps by submitting a draft of their script to their instructor or their peers for suggestions on ways to improve science concept integration and description. Conversely, candidates in the MAT biology cohort effectively included science content in their story podcasts, but most did not support understanding of academic and scientific language use through explanations in the podcast itself. This population of candidates had a strong science background and, thus, were likely more comfortable making connections between science concepts and everyday life. This cohort of candidates included a high number of career changers, most of whom had some kind of medical background, which was reflected in their choice of content as well. It may also have influenced the amount of content they included in their podcasts. These candidates generally attempted to include a much heavier science concept load in their stories. The analysis of story podcasts provides some evidence that the secondary candidates in the study were unsure about how to use language in their story podcasts. Although the percentage of words included on the GSL for this cohort could be considered appropriate for a general secondary student audience, six of nine of the podcasts included over 2% vocabulary from the AWL, and candidates did not explain any of the academic words included in the context of the podcast or in the teachers’ guides. In addition, scientific vocabulary load for almost all of these podcasts was high. Each podcast included at least a few explanations of this scientific vocabulary, but although accompanying teachers’ guides included more background knowledge and explanation, some terminology was left unexplained. The pacing of many story podcasts was only slightly faster than that of the elementary teacher candidates, with an average of 164 words/ minute and a range between 115 and 201 words per minute. The podcasts that contained the highest number of words per minute, however, were also the podcasts that included a high number of words that could be classified as scientific vocabulary: “MRSA,” 201 words/minute and 31 science vocabulary words; “Hypothermia,” 200 words/minute and 23 science terms; and “A Tale of a Horse,” 192 words/minute and 37 science terms. Since this group of candidates had a strong science content background, they would likely respond well to being exposed to data supporting the contention that they used more academic and scientific language than they realize, so introducing them to tools like AntWordProfiler for their own use in analyzing their language could be an effective way to support their understanding of language use in speech and writing. The personal science story assignment has the potential to tie together a number of pedagogical skills that we seek to facilitate in our teacher candidates: connecting science concepts to everyday life, connecting to their students using principles of culturally responsive pedagogy, and reflecting on and supporting science literacy and language use. The pilot studies described here have given us some important baseline information about where teacher candidates may be starting in terms of these skills and what kinds of scaffolds and supports we should integrate in order to help candidates get the most out of this kind of digital storytelling assignment. Based on these findings, we redesigned our personal science story podcast assignment to reflect our intentions better and to scaffold the constructs of science content integration, culturally and linguistically responsive teaching, and academic vocabulary for our preservice teachers. We have incorporated supports to the assignment, including “Story Circles,” which are intended to assist candidates in selecting an appropriate story with a dramatic question, climax, and resolution, and discussing science content that might connect with the story, as well as giving the candidates opportunities for peer editing. We also added a language analysis component to the assignment, in which candidates submit drafts of their podcast scripts to AntWordProfiler and websites that calculate readability scores (e.g., http://readable.io). The intention of the language analysis portion of the assignment is to give teacher candidates an opportunity to collect data about the language present in their podcast scripts and then reflect on whether or not they should make changes to the language based on what they know of their students; for example, if they discover a high percentage of academic or scientific vocabulary, they might decide to include more definitions in context or they might change some of the words that might be confusing. A copy of the revised assignment can be found at http://telbionoyce.weebly.com. This material is based upon work supported by the National Science Foundation under Grant No. 1340020. Any opinions, findings, and conclusions or recommendations expressed in this material are those of the authors and do not necessarily reflect the views of the National Science Foundation. Borsheim, C., Merritt, K., & Reed, D. (2008). Beyond technology for technology’s sake: Advancing multiliteracies in the twenty-first century. The Clearing House, 82, 87-90. Borgia, L. (2009). Enhanced vocabulary podcasts implementation in fifth grade classrooms. Reading Improvement, 46, 263-272. Chase, S.E. (2005) Narrative inquiry: Multiple lenses, approaches, voices. In N.K. Denzin & Y.S. Lincoln (Eds. ), The Sage handbook of qualitative research (3rd ed. ; pp. 651-659). Thousand Oaks, CA: Sage Publications. Coxhead, A., Stevens, L., & Tinkle, J. (2010). Why might secondary science textbooks be difficult to read? New Zealand Studies in Applied Linguistics, 16, 37-52. Dong, Y. (2002). Integrating language and content: How three biology teachers work with non-English speaking students. International Journal of Bilingual Education and Bilingualism, 5, 40-57. Frisch, J.K., & Saunders, G. (2008). Using stories in an introductory college biology course. Journal of Biological Education, 42, 164-169. Frisch, J.K. (2010). The stories they’d tell: Preservice elementary teachers writing stories to demonstrate physical science concepts. Journal of Science Teacher Education, 21, 703-722. Greene, J. (2008). Academic vocabulary and formulaic language in middle school content area textbooks. Unpublished doctoral dissertation, Georgia State University, Atlanta, GA.
Harris, R., Hall, C., Hawkins, T., Hartley, M., McCray, W., & Sirleaf, H. (2016). Oral science stories: Using culturally responsive storytelling to teach socioeconomically disadvantaged students. Science and Children, 64-68. Ivala, E., Gachago, D., Condy, J., & Chigona, A. (2014). Digital storytelling and reflection in higher education: A case of preservice student teachers and their lecturers at a university of technology. Journal of Education and Training Studies, 2, 217-227. Lambert, J. (2002). Digital storytelling: Capturing lives, creating communities. Berkeley, CA: Digital Diner. Lambert, J. (2010). Digital storytelling cookbook. Berkley, CA: Digital Diner. Lee, O. (2002). Science inquiry for elementary students from diverse backgrounds. In W.G. Secada (Ed. ), Review of research in education (Vol. 26; pp. 23–69). Washington, DC: American Educational Research Association. Lee, O., Buxton, C.A., Lewis, S., & LeRoy, K. (2006). Science inquiry and student diversity: Enhanced abilities and continuing difficulties after an instructional intervention. Journal of Research in Science Teaching, 43, 607-637. Lee, O., Quinn, H., & Valdes, G. (2013). Science and language for English language learners in relation to next generation science standards and with implication for common core state standards for English language arts and mathematics. Educational Researcher, 42, 223-233. Lemke, J.L. (1990). Talking science: Language, learning, and values. Norwood, NJ: Ablex. Linett, P. (2013). The thoughtful museum: Interview: Ben Lillie on science and the storytelling revival. Curator, 56, 15- 19. Moll, L.C., Amanti, C., Neff, D., & Gonzalez, N. (1992). Funds of knowledge or teaching: Using a qualitative approach to connect homes and classrooms. Theory Into Practice, 31 (2), 132-141. Patchen, T., & Cox-Petersen, A. (2008). Constructing cultural relevance in science: A case study of two elementary teachers. Science Education, 92, 994-1014. Pearson, P., Moje, E., & Greenleaf, C. (2010). Literacy and science: each in the service of the other. Science, 328, 459-463. Pegrum, M., Bartle, E., & Longnecker, N. (2015). Can creative podcasting promote deep learning? The use of podcasting for learning content in an undergraduate science unit. British Journal of Educational Technology, 46, 142-152. Polkinghorne, D. (1995). Narrative configuration in qualitative analysis. International Journal of Qualitative Studies in Education, 8, 5-23. Putman, S.M., & Kingsley, T. (2009). The Atoms family: Using podcasts to enhance the development of science vocabulary. The Reading Teacher, 63, 100-108. Reese, L. (2012). Storytelling in Mexican homes: Connections between oral and literacy practices. Bilingual Research Journal, 35, 277-293. Shelby-Caffey, C., Ubeda, E., & Jenkins, B. (2014). Digital storytelling revisited: An educator’s use of an innovative literacy practice. The Reading Teacher, 68, 191-199. Silva, C., Weinburgh, M., & Smith, K.H. (2013). Not just good science teaching: Supporting academic language development. Voices From the Middle (20), 34- 42. Smythe, S., & Neufeld, P. (2010). “Podcast time”: Negotiating digital literacies and communities of learning in a middle years ELL classroom. Journal of Adolescent & Adult Literacy, 53, 488-496. Sorensen, B.E. (2012). The art of storytelling. Tribal College Journal, 24. Tosun, T. (2000). The beliefs of preservice elementary teachers toward science and science teaching. School Science and Mathematics, 100, 374–379. Vasinda, S., & McLeod, J. (2011). Extending readers theatre: a powerful and purposeful match with podcasting. The Reading Teacher, 64, 486-497. West, M. (1953). A general service list of English words. London, UK: Longman, Green and Co.